As with every month, Ace2Three has brought another big opportunity to boost your account at the end of the month. 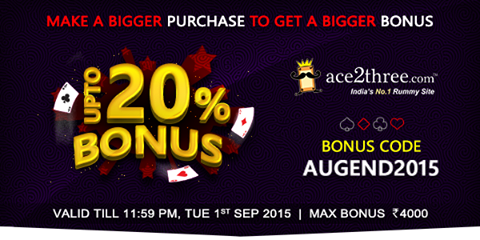 While you purchase your chips with Ace2Three Rummy, grab a big bonus of up to 20%. Play online rummy for more hours and end the month of August on a high note! The rummy chips bonus offer is valid till 1st Sep, Tuesday. So, make your purchases today and grab the extra real chips! To make your chip purchases with Ace2Three, just login to your account and click on Buy Chips tab. Select the number of chips you want to purchase from the drop down menu and add the bonus code AUGEND2015 in the field below. Once your purchase is carried out successfully, you will receive your rummy chips bonus credited to your account. Start playing and have unlimited fun on the online rummy tables with these extra real chips.